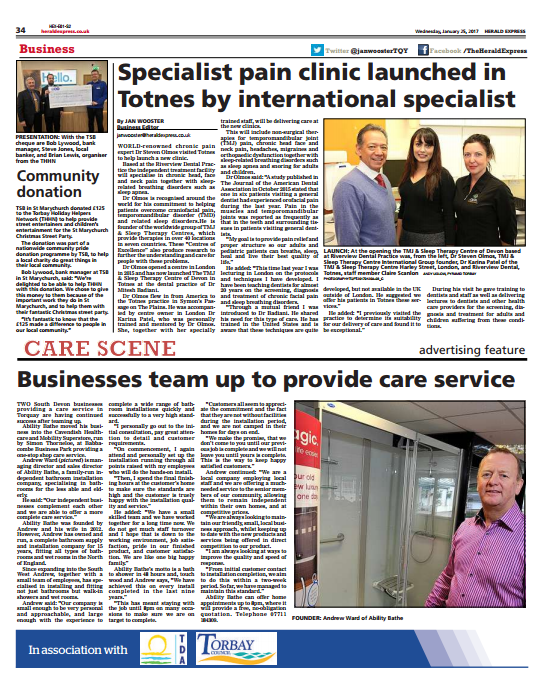 World-renowed chronic pain expert Dr. Steven Olmos visited Totnes to help launch a new clinic. Based at the Riverview Dental Practice the independent treatment facility will specialse in chronic head, face and neck pain together with sleep-related breathing disorders such as sleep apnea. According to a 2011 Gallup poll, almost half of U.S. adults experience some kind of chronic pain. The Journal of the America Dental Association ran a series of articles this year demonstrating that one in six patients who visited a dentist reported craniofacial pain (affecting the mouth and face), especially pain in the temporomandibular joints and muscles (the jaw and temples). This type of pain was reported as frequently as tooth or gum pain, and it’s estimated the craniofacial pain affects over 20 percent of the U.S. population. This series included data showing that one in six children (school and pre-school age) have chronic facial pain and TMD (temporomandibular dysfunction). At TMJ & Sleep Therapy Centres we understand the complexities of craniofacial pain that are unique to each patient. Some patients experience TMJ pain and dysfunctions, some experience primary headaches (known as Migraines, tension or cluster) while others may have facial neuralgias, musculoskeletal pain or a combination of all. TMJ is one of the conditions most frequently identified by patients. This is a very real condition caused by disturbances in the action of the jaw. Research has shown that many factors may lead to this disorder – it can occur by itself or be a part of a more complex problem. We believe that there is usually more than one factor responsible. Causes may include macro traumas: automobile accident, sports injury, accidental falls etc., or micro traumas of clenching and grinding of the teeth (bruxism), which causes the muscles that stabilize the joint to become fatigued from overwork resulting in head, face, jaw and muscle pain. Often the jaw problems, head and facial pain, headaches, migraines and musculoskeletal pain are symptoms of a greater problem affecting the body, much like a fever is secondary to the common flu. In the absence of an acute injury to the head or facial area, we believe the primary cause of these problems is frequently related to insufficient oxygen while sleeping i.e. an unidentified sleep breathing obstruction, Sleep Apnea or Obstructive Sleep Apnea. Everyone assumes they are breathing and getting enough oxygen during sleep; few recognize that nighttime teeth grinding and clenching is an unconscious effort to prevent suffocation. This repeated action all night long over extended periods of time wears down the skeletal structure and the joints resulting in TMJ pain, headaches, musculoskeletal pain, TMJ dysfunctions and facial neuralgias. Facial pain, headaches and jaw problems are frequently only a symptom secondary to a greater problem affecting the body, much like a fever is secondary to the common flu. If any of the following symptoms affect your daily life or you are taking regular pain medication or sleeping aids, you may be suffering from TMD and should be evaluated by a dentist trained in diagnosing and treating these disorders. We are here to help you!! TMJ & Sleep Therapy Centres understand the unique needs of both adults and pediatric patients, and we are committed to the highest standard of care. 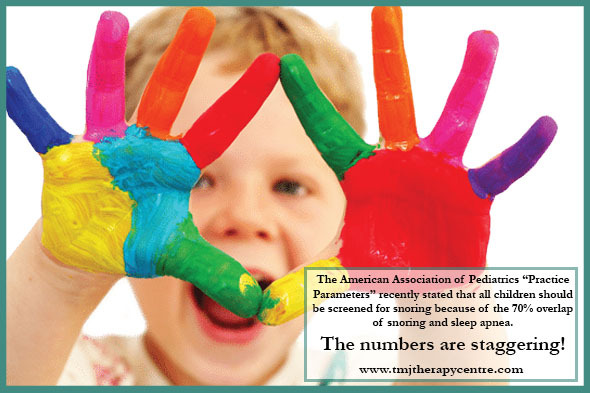 Sleep breathing disorders in children, particularly pediatric obstructive sleep apnea (OSA), often goes undiagnosed. OSA can occur in children at all ages, including infants. However, children may instead be treated for ADHD, since hyperactivity can actually be a symptom of OSA. Untreated OSA can lead to more severe health problems, including diabetes, cardiovascular disease and hypertension. y but abruptly woken up throughout the night in order to open the airway and breathe. Bruxism, or teeth grinding, is also a symptom of sleep apnea—it’s an unconscious movement to open the airway while sleeping. Children who suer from this interrupted and poor sleep suer from excessive sleepiness during the day, hyperactivity or irritability, migraines and even depression or cognitive impairments. Luckily, pediatric OSA can be cured because in children, it’s possible to manipulate the development of their airways so they aren’t blocked or obstructed as they grow up. The American Academy of Pediatrics recommends all children get screened for snoring, and those who do snore should undergo further evaluation to test for OSA and other sleep disorders. Dentists are often able to provide a preliminary screening for OSA and can refer patients to a sleep specialist for further screening and treatment. 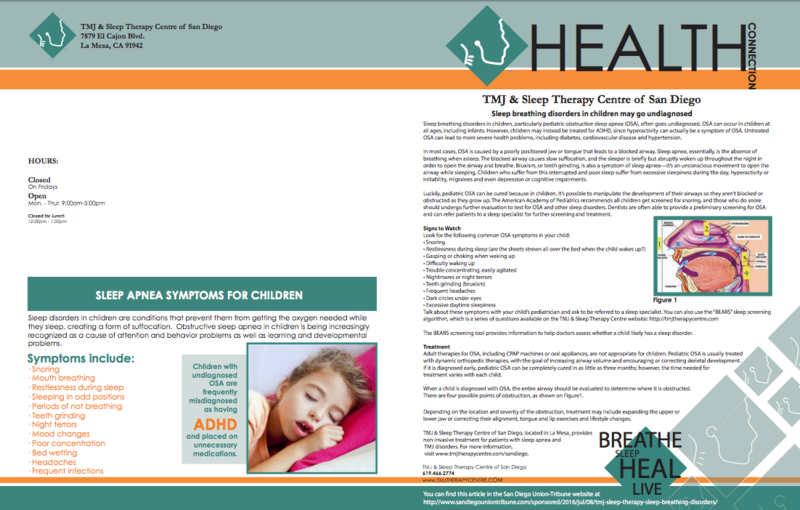 The BEARS screening tool provides information to help doctors assess whether a child likely has a sleep disorder. Adult therapies for OSA, including CPAP machines or oral appliances, are not appropriate for children. Pediatric OSA is usually treated with dynamic orthopedic therapies, with the goal of increasing airway volume and encouraging or correcting skeletal development. treatment varies with each child. When a child is diagnosed with OSA, the entire airway should be evaluated to determine where it is obstructed. Depending on the location and severity of the obstruction, treatment may include expanding the upper or lower jaw or correcting their alignment, tongue and lip exercises and lifestyle changes. San Diego, CA – March 6-13, 2016 – TMJ & Sleep Therapy Centre joins National Sleep Foundation in their focus to bring the importance of sleep awareness and education to the American public. NIH (National Institutes for Health) has identified that sleep related breathing problems such as obstructive sleep apnea and snoring affect 50 to 70 million Americans. Obstructive sleep apnea has no age boundaries; it affects both adults and children. All of us at TMJ & Sleep Therapy Centre of San Diego want to wish you Happy Holidays! We would like to take this opportunity to let you know of some exciting and important announcements. We are very happy to announce that Dr. Olmos has opened our newest Centre in Dubai, UAE alongside the London Sleep Centre. This is a very exciting collaboration with one of the top sleep physicians in London and they have already had several top dignitaries from the region come to be treated. Dr. Olmos has also received his Tennessee dental physician license and is not only lecturing at the University of Tennessee, but he is working with top pediatric physicians in the area to bring sleep related breathing disorder treatment to local children that are not successful in using C-PAP. Remember, sleep apnea can be cured in children! If you are concerned about your child not sleeping well or having trouble in school, please call us for an appointment today! Most of you should have been personally contacted, but for those that he was not able to reach, Dr. Chase Bennett has decided to move to Denver to focus solely on his practice there. We wish him well. Our founder, Dr. Steven Olmos will now be available to see patients in San Diego as his schedule permits. We have rearranged his schedule to allow more time in San Diego to treat patients. We are also so proud to announce that Dr. Olmos has received his Master of Excellence from the American Academy of Craniofacial Pain (AACP). The AACP is committed to the relief of craniofacial pain, temporomandibular disorders and sleep related breathing disorders and supporting the advancement of education, research and dissemination of knowledge and skills in these areas. Because of his skill and advancement of these areas, Dr. Olmos has also been voted President Elect of the AACP. Congratulations Dr. Olmos! As the only American Academy of Dental Sleep Medicine accredited facility in San Diego, we are constantly striving to bring our community the highest level of care. With 36 Centres in 6 Countries our treatment is proven again and again. Please don’t hesitate to callfor more information. Thank you for your referals we are here to help!